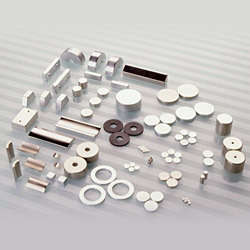 China Smart Magnet, manufacturer, OEM, seller, supplier, vendor(vender), manufacturer & exporter, specialized in producing various permanent magnet (such as NdFeB magnet, AlNiCo magnet, SmCo magnet, Ferrite magnet, flexible magnet, rubber magnet) and lots of magnetic parts(Magnetic Jewelry, Magnetic Jewellery, Permanent Magnetic Chuck, Magnetic Lifter, Magnetic Door catcher, Magnetic Holding, and Magnetic Bar, etc).We also can make the magnetic products according to customer's requests or designs. 1. TQM oriented, Quick Responds, Competitive price, JIT delivery on demands--- Are key competencies of Smart Magnet. 2. We have achieved good reputation in worldwide magnet market, our business partners are around America,Europe, Asia... We provide satisfactory for customers on their demands.